Rain barrels allow you to capture the rain that falls onto your roof and reuse it later to water your garden. Plants and microbes prefer rainwater because it is naturally “soft” and free of chlorine, fluoride, and other chemicals. Rain barrels can help reduce ocean water pollution by preventing rain from carrying fertilizers, pet waste, and harmful debris from your property out into the ocean. 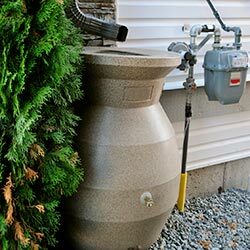 Residential Rebate Level: $35 per rain barrel or $250 to start per cistern.